I have finally started reading the fantastic new hockey novel Pond Hockey: Rediscovering The Game by Brian Kennedy. 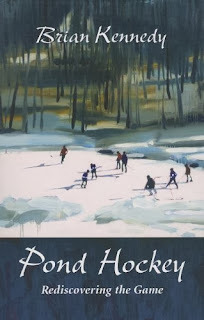 Kennedy, of course, is the author of Growing Up Hockey and Hockey Is My Country (and covers the LA Kings and Anaheim Ducks when not writing books). So readers familiar with his previous work will not be surprised by my "fantastic" designation. How fantastic is it? I get up at 4 am and the last couple of nights I've stayed up past midnight wrapped up in it. And, as a rule, I don't particularly like fiction. There is an exception to every rule and that exception is reserved for Brian Kennedy. Pond Hockey inspiring story tells the tale of a country boy who seeks his fortune in the big city only to encounter bitter defeat. But when Todd Graham returns to his rural home town, he rediscovers the local pond where he spent many happy hours, as well as, the ghost of a past life where he experienced a defeat that has haunted him ever since.